Save the Queen--Bee that is. If you are concerned about the Bees, this might Bee a project you would like to invest in. Gene Wall Cole is a beekeeper and an author and researcher who is creating a unique Bee Garden/Sanctuary and filming the process so others might create bee gardens of their own. One third of the bee population in America died this past winter. Many people believe we're literally running out of time to avert an ecological disaster. So, if you would like to learn more, check out this video and then visit Cole's Kickstarter project site. Sometimes (although admittedly less and less) when I talk to people regarding the power of urban agriculture to transform the local economy of Garland and other cities across the USA, I get the deer in the headlights expression in their eyes. And some still don't understand the direct connection between a locally-based agricultural system and the potential prosperity and food security for a local area and its people. Those of us who are founding Loving Garland Green do understand and embrace the power to grow our local economy with local agriculture. One of our stated goals is to ensure that at least 50,000 people in Garland are growing crops in their homes--whether in pots or in their yards--by the end of 2014. We hope to track and introduce these people and their gardens on our website. Not only will the Garland Community Garden and Urban Agricultural Center furnish fresh food for distribution in our community, it will also serve as a living example to help citizens build gardens in their own yards, patios and decks. We want to grow Garland into the city with the most urban gardens per person in the nation. We want to make urban gardens one of the reasons why people want to live in our city. Our mission is to engage our residents to help us make this dream a reality. 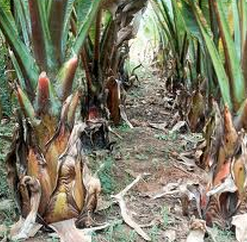 A perfect example of local agricultural power is Enset, the Ethiopian or false banana. Enset is a locally domesticated staple food crop that grows in the moist highlands of southwestern Ethiopia. According to Christensen Fund's editor, the starchy stem of the plant is consumed, but the entire plant is used for everything from roofing packaging to cultural ceremony. Enset also grows well intercropped with other cash crops such as coffee. So what is Garland's equivalent of Enset? I'm not entirely certain at this point because I've not done extensive research on the topic. However, it could be bamboo. We have creeks running all over our municipality and along these creeks we have large lush bamboo forests. We could build on this natural potential. I've written on the potential for bamboo to strengthen our local economy in prior posts. From Iflizwerequeen: "We have groves of bamboo growing along the banks of creeks all over Garland and the proposed location for our Garland Community Garden is no exception. Again with just the slightest bit of promotion, we have a built in natural product to sell to the public as a fund raiser for our garden. Volunteers can harvest some of the leaves from the bamboo, and package them to sell as bamboo tea. Many believe that bamboo tea promotes improved health. Again, with just a little marketing and promotion this could be another great fund raiser. However, if we became more serious as bamboo urban farmers, bamboo could be harvested for many other purposes. Hemp is the only other plant that rivals bamboo for 1) its fast growth rate and 2) its versatility as a base for hundreds of other types of products." Tonight, if the weather man is to be believed, the mercury will dip to 28 degrees F here in the DFW area. Like many urban gardeners, Charlie and I have been scurrying about covering our vegetables to protect them from the frost. Below is a photo taken from Charlie's poolside area. You would never suspect that hiding behind those the two mounds are four-foot tall tomato plants with about fifteen large green tomatoes. 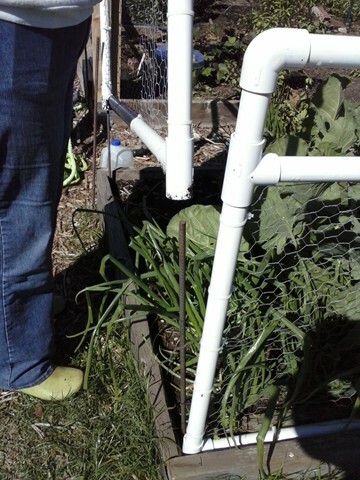 We covered brocolli, brussel sprouts, marigolds, peas, beans, eggplants and seven tomato plants. 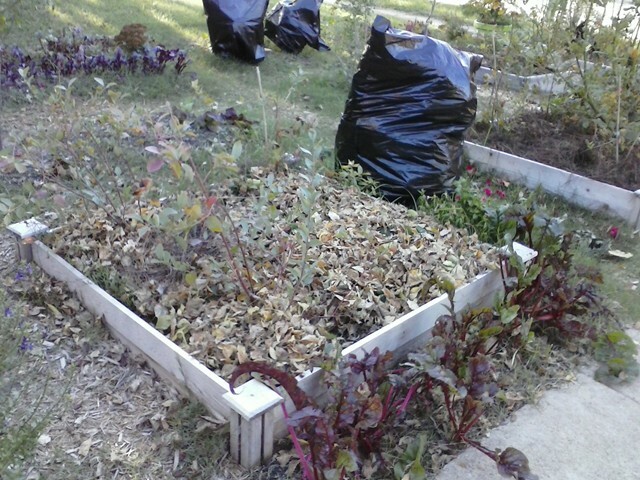 At my own home, I spent about three hours in Urban Gardens I, II and III preparing the gardens for the first frost. Below is a photo I've titled "The last Roses of 2013". The rose bush in Urban Garden I is covered in buds. 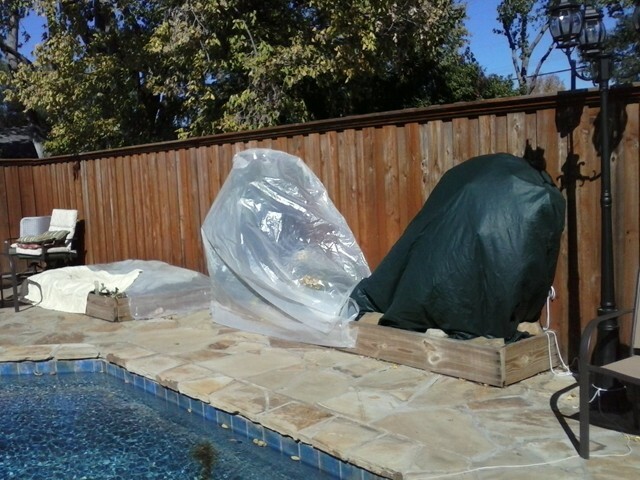 I hope the trash bag I covered it with will protect it from Jack Frost. If not, then I still have a lovely bouquet to enjoy for a while. 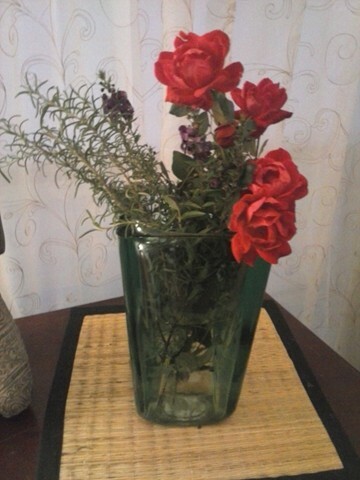 All the other flowers that are in pots were brought into my home or garage. Today was the day I decided to pull most of my herbs. I want to dry them and then give little bottles of dried herbs to my friends for stocking stuffers. Perhaps Love Garland Green will do the same next fall with our herbs and add the sale of those items to our holiday fundraiser. 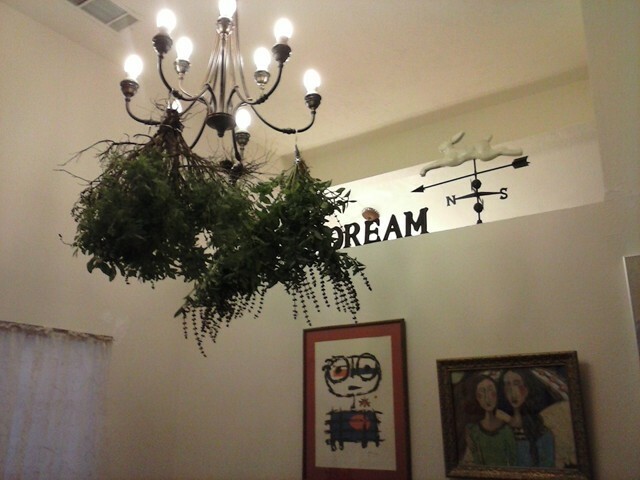 I didn't know where to hang the herbs, but I knew I didn't want to hang them in my garage because I've had a resident rat who has lived in the rafters there for as long as I can remember. We have an unspoken agreement: As long as he does not come into my house, we will live in peace. I know that if I put the herbs in the garage, he would consider the plants as his food because the garage is his territory. 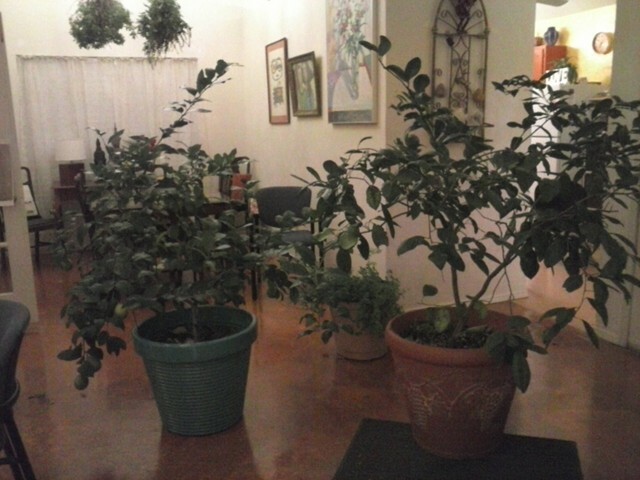 The Lemon and Mandarin Orange trees were brought back in the house. The lemon tree, which I brought with me from California 8 years ago, and I have a great relationship. Every year for the past 6 years the tree has faithfully produced anywhere from 15 to 35 luscious lemons. Currently it has 17 lemons which should be ripe about the second week of December. The Mandarin Orange tree is another relationship altogether. It produces 2 to 5 oranges every other year. Thus, every year for the past four years, I've threated to let it stay outside and die during the winter. This year was no different. In fact, this year I came very close to leaving it outside. Its roots had exceeded the limits of the pot and taken root in the ground. But just at dusk I gave it another chance and brought it indoors. Maybe next year. . .
As our members continue to work on the action items related to filing Loving Garland Green as a members-directed nonprofit, I'm reminded of how talented the people are on the core team. We all come from various backgrounds and life experiences. Tonight I received a logo design from one of our members, Robert Opel, a local artist and designer. In a previous post I included some preliminary designs by another member of our planning team, Ken Dyer who designs signs for a living. Below is Robert's design. I like that it features a heart. I hope the logo we select will feature a heart as the heart shape is such a strong and positive iconic figure. 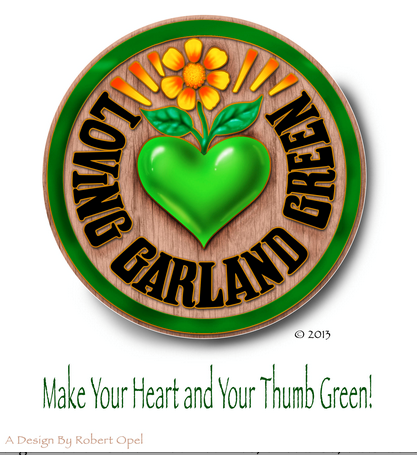 It is also very compatible with the name we have chosen for our nonprofit, "Loving Garland Green." I'm hoping that all the members of the planning committee will submit their ideas for the logo and then we will vote on the one we like the best. [Perhaps as part of the selection process we might ask members to refrain from choosing the one they submitted. Perhaps someone on the team will have a better idea as how to make this decision in a democratic way that will serve the best interests and purpose of our organization.] Another possibiity is that we might open to the design of our logo to the community. Perhaps that would be a good way to engage people and advertise our presence. Lots to consider. Even I have taken a stab at the logo design. I prefer a simple, sleek, modern look. or perhaps with a plant in the heart. 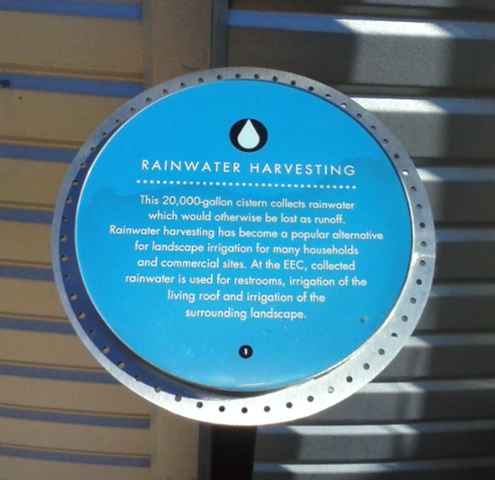 . .
Amidst mundane but necessary research on water tanks and rainwater harvesting issues related to the Garland Urban Agricultural Center and Community Garden, my thoughts turn away toward considerations of its beauty and aesthetics. In addition to all its practical aspects, I'm hoping that it will also be a place of beauty and refuge for Garland residents and visitors--a place similar in beauty to the Arlington Garden in Pasadena, California. In the video provided below you can take a tour of this beautiful site if you wish. Using now technology- The Arlington Garden has created an app that visitors can use as a guide when visiting their garden. We will create a similar app for the Garland Community Garden area as well. Then people can read related information and stories about the various garden beds and plants as they walk about the garden. Yes, I can tell that life in my urban gardens (1,2, and 3) is slowing down for the coming winter. I'm reminded of what Sydney Eddison wrote in her book, Gardening for a Lifetime: "of all the lessons that gardening has taught me, the hardest to digest inwardly has been the acceptance of imperfection." When it comes to gardening, I'm gradually learning to go with the flow and appreciate the glorious moments for what they are--brief and beautiful. Ben Jonson understand that well. Perhaps he was a gardener too--he once said, "In short measures life may perfect be." Key phrase here is "short measures"--that's the part I still need to work on as I tend to expect "extended measures." A lot of my pleasure in the garden comes from merely ambling around it wihout any special purpose--just looking at the plants and appreciating them and marveling at my ability to have tended them to maturity and fruition. I just came inside after a walk through my garden this morning and, in spite of the fact that it is looking a bit raggedy around the edges, it still contains promise of more. 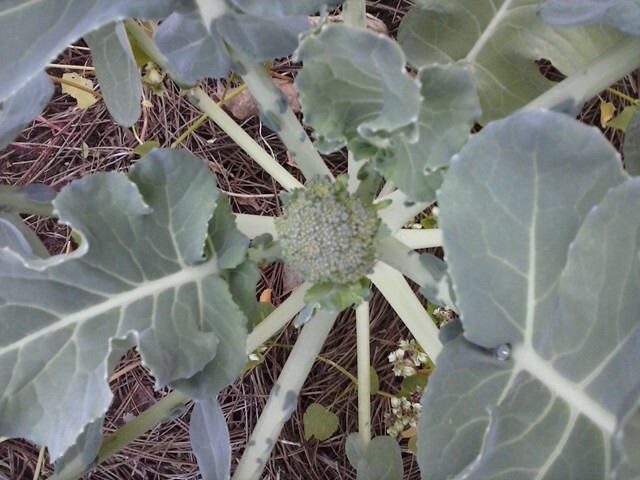 I was surprised this morning to see the stirrings of a broccoli as I had given up hope on this plant. Perhaps the lesson here is to have a little more faith. 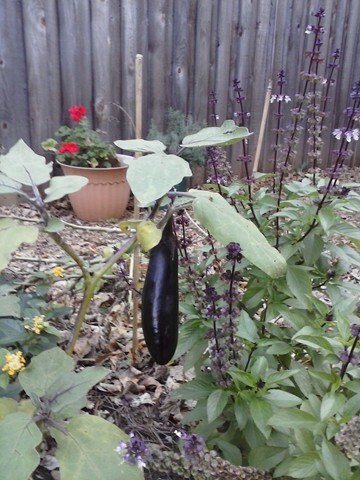 And my ichiban eggplants (six of them) continue to produce. 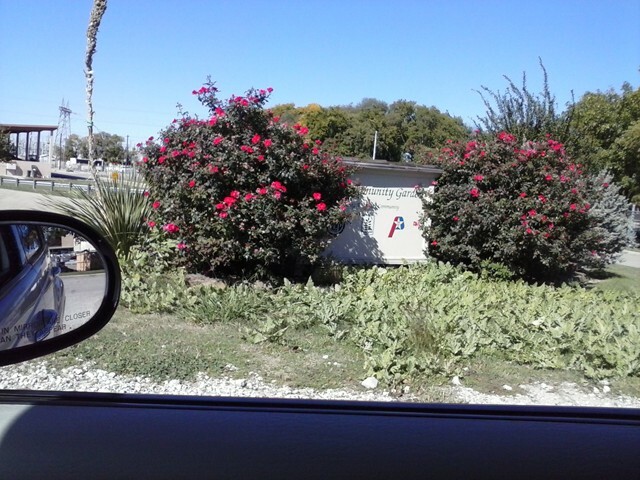 I know that next year I'll be sure to plant them again and I'll encourage others who live in Garland to do the same. Since this is my first garden ever, I can say with some certainty: "If I can grow it, anyone can." The only plant in my garden this year more prolific than the egglants has been the okra. (I'm convinced that okra would survive in Death Valley if it were planted there.) 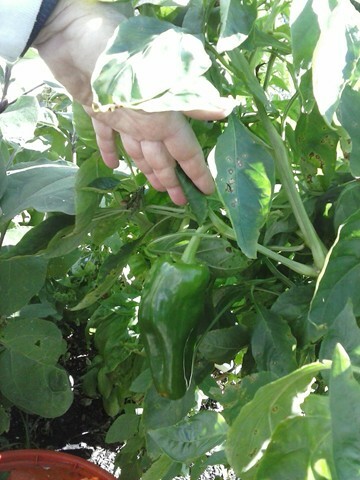 Below is a photo of one of the ichiban eggplants this morning busily producing more food for me. 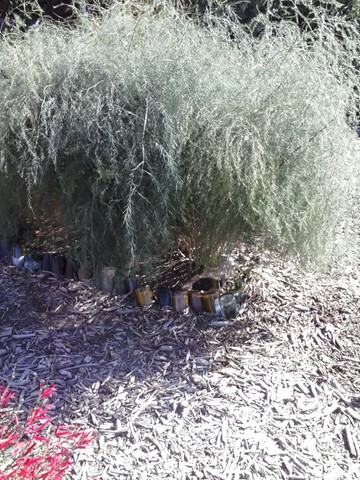 As you can also see, the lemon herb plant has gone to seed. I need to harvest those seeds for myself and the community garden. 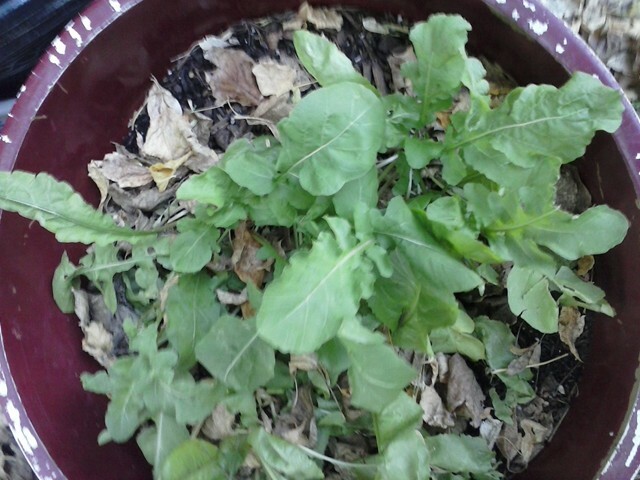 Below is a pot of mixed lettuce that I have growing in a container. Again, the lessons for me here are twofold: accept imperfection, keep the faith and don't give up hope as better times may be just around the corner. Sometimes the best action is no action--although rarely the case in a garden. Back in mid-September, I almost yanked this lettuce out of the pot. It was looking so pathetic and had been for about a month. I had decided it would not grow and was on its way in the opposite direction. However, I got busy with other things and left it alone. Now, thanks in great part to my unintentional neglect, I'll have a nice salad for two from this pot. As I may have mentioned before, central to the mission of Loving Garland Green is increasing our residents awareness of the virtues, pleasures, and importance of gardening. In fact, our byline is: instead of a chicken in every pot, a garden on every lot. Kellie Dyer, a science and math educator herself, will be heading up these efforts for Loving Garland Green. As I continue to procrastinate my self-assigned task to clean out half my garage this morning, I'm looking over and reading again passages from some of my favorite garden books. 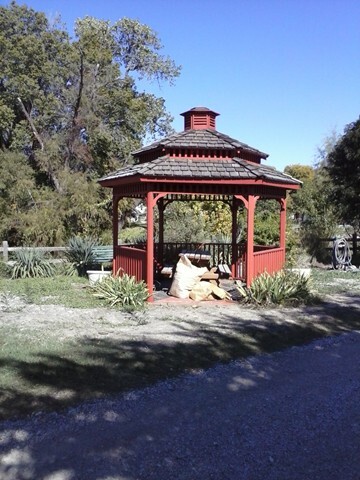 Because gardening is such a seasonal activity requiring that gardeners do certain things according to nature's timetable, I'm sure that all of our activities at the Garland Urban Agricultural Center will also follow nature's schedule--from actual gardening to our related educational activities. ". . . Lady bugs are gardeners good friends as they eat a lot of unwelcome insects. It's simple to make a home for them to hibernate in over the winter. [Who knew Lady Bugs hibernated?] Wash thoroughly an old can such as one for baked beans. Pack it with wide drinking straws cut to the height of the can. Toward the end of the summer, place it sideways a few feet off the ground so the rain does not get in. [Perhaps on top of a concrete block with rocks on either side so it doesn't roll off.] The Lady Bugs, spiders and other insects will be happy to have a warm winter home." Of course, using our example of Lady Bug Homes, that company would have to come up with other garden-related products in order to grow their business, but perhaps if they distributed nationally, having a local market to establish their business might be all they needed. Gardens bring people together and increase community love while growing the local economy by stimulating the development of new markets. Perhaps readers who didn't before will now see better how encouraging urban agriculture can stimulate the local economy--not just through the direct sale of the produce, but over many other related and local avenues including local investment and financing of many of these activities. The garden is as infinite as nature in its ability to give and grow local economies. I've only had a garden for two seasons, but I know enough to realize that no one has enough time to learn all the lessons a garden can teach--even if they were given two lifetimes. Increase urban gardens = increase markets for the local economy. Increase markets for local economy = increase the connectedness of the local residents. Increase the connectedness of the residents = increase the love. Increase the love = increase the safety, health, prosperity and well-being of all the residents. As Peter Kageyama points out in his book, For The Love of Cities: " . . . We see the benefits of love in everything. When children, plants, pets, plants, and even objects are loved, they thrive. (Compare a car owned by a car lover to one owned by the rest of us.) The same is true of our places. When we love our city as when we love another person, we will go to extraordinary lengths for them. When we have an emotional connection to a place, we are less likely to leave it and far more likely to champion it and defend it in the face of criticism. . . . When cities make themselves easier to connect with emotionally--when they make themselves more lovable--they invite the human heart to become the driver of community, economic and social development. . . To help us fall in love with our cities again, we need to see others who are in love with their communities. . . These people are critical to the overall health of their places." And that is how I see the members of the Planning Committee for Loving Garland Green. We love our community and we are inviting others to join us in Loving Garland Green. Together we can grow plants and much more. It's Official! 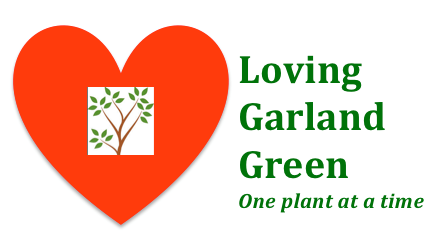 We are now to be known as "Loving Garland Green"
Loving Garland Green--Instead of a "chicken in every pot", we support a "garden on every lot." Last night the planning committee for the Garland Urban Agricultural Center and Community Garden met and voted on the name for the nonprofit corporation we are forming. 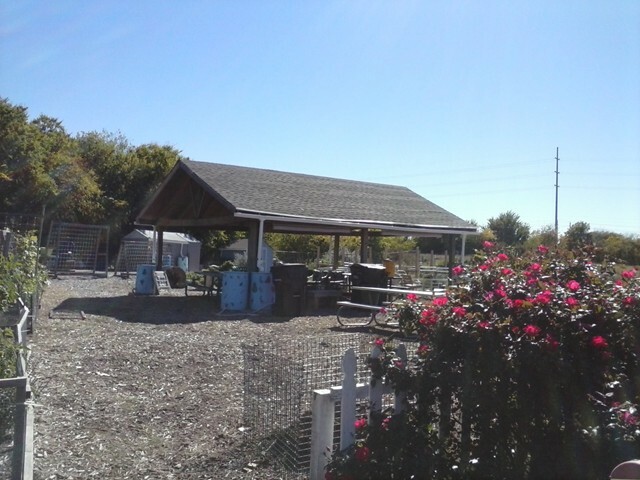 We aim to strengthen and increase urban agriculture within the boundaries of Garland, Texas. Thus, our goal is to increase the number of gardens and urban farmers within our city limits by providing a place for residents of all ages to come together and learn by doing. The more urban farmers and gardens a municipality has, the healthier, more connected, safer, and more prosperous the residents will be. Among many other exciting things planned for our website, we will initially ask all Garland residents with vegetable gardens to please register on our site and to submit photos whenever possible. We will track and also list the new gardens as they are built and submitted to our site. The website will be a central place for residents to share triumphs and challenges they face as urban gardeners in our community. The approximate 3-acre Garland Urban Agricultural Center and Community Garden, to be located at 4022 Naaman School Road, will provide spaces for Garland residents to grow produce and share a portion of it with other members of our community. In addition, this location will offer many hands-on learning opportunities such as setting up rainwater harvesting systems; growing food using aquaponic technology; learning how to turn their own backyards into woodland gardens; mulching; composting; worms as friends; and yes, even beekeeping. 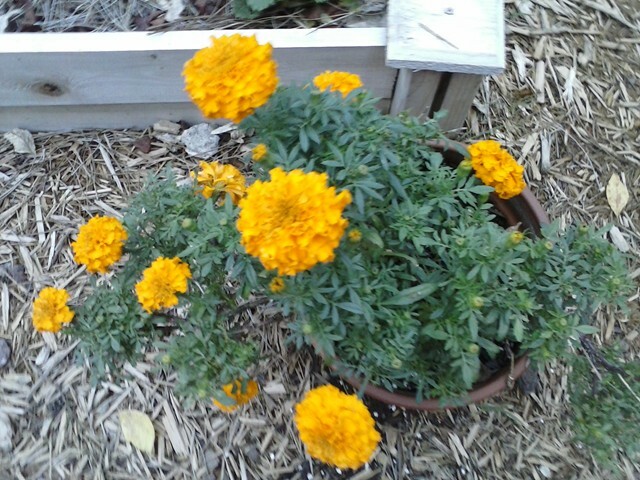 Note: The petals of marigolds are nutritious and add a colorful surprise to almost any dish. Be sure to cut them just above the place where they connect to center as that little white/green tip is somewhat bitter. 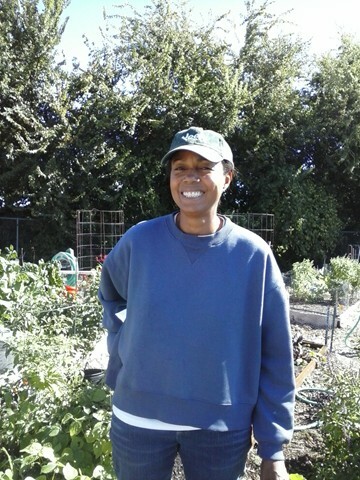 Two more Garland residents have joined the planning committee for the Garland Urban Agricultural Center and Community Garden--Ken and Kellie Dyer. I met both of them this August at the Garland Marketplace event on the square in downtown Garland and I'm looking forward to their participation on this project. Kellie is a school teacher and Ken is a sign designer. Look at a few of his preliminary designs for a logo (Using "loving Garland Green" as an example.) Tonight I'm hoping we will decide on a name and a mission statement. After establishing our identity, we will be able to move ahead full speed with creating the rest of our business plan and submitting it to Mayor Athas and other appropriate members of Garland city government. To date I've gathered 24 pounds of Texas native pecans. As the lead co-creator for fundraising, my goal is to double that poundage over the coming weekend and by next weekend I hope to have 100 pounds of Texas native pecans. Eventually before this fund raiser is over mid-December, we hope to have sold over 300 pounds. Look for members of our team to hit the Garland streets the weekend before Thanksgiving. We will be selling Texas native pecans at $3 a pound on street corners all over Garland. This first fund raiser has a primary purpose of creating interest and public awareness of who we are and what we hope to accomplish. Of course, we also plan to raise at least $900. As part of our business plan, we have several seasonal fund raisers planned. 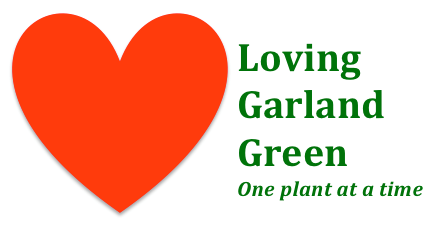 Put the Love and History of Texas Native Pecans in Your Holiday Baking by supporting Love Garland Green --our Thanksgiving and Christmas fund raiser. Other fund raisers planned include: Give Us Your Best New Year's Resolution; Give Garland Your Heart on Valentine's Day; DFW Community Gardens Tour--Spring 2014; A Midsummer's Night Dream in Garland; and Fall for Garland. These will be recurring annual events. In addition to these fund raisers, we will of course apply for various grants that suit our profile and mission as a nonprofit. I am also exploring the possibility of appealing to people through online funding tools such as Kickstarter. Julia Childs was quoted as once saying: "You can never have too much butter." You can quote iflizwerequeen as saying: "A nonprofit doing good for the community can never have too much money." And that's why I'm in charge of fund-raising for our group. Today, in our continuing quest to learn how others manage their community gardens in the DFW area, Charlie and I visited the Plano Community Garden--and what a learning experience that was! I'll tell the story of our visit in captions to photos that I took there today. 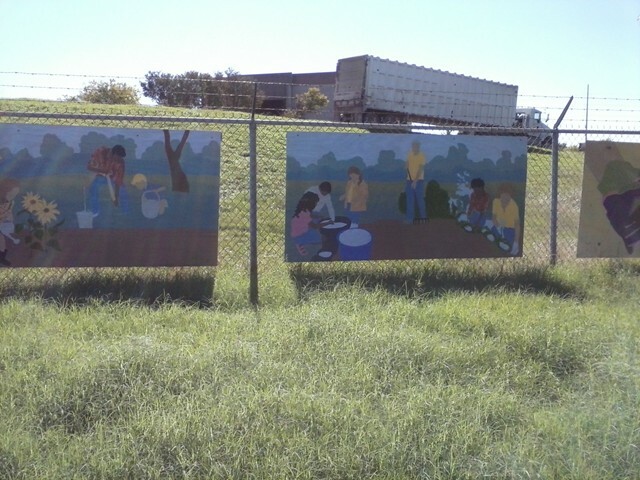 The photos above are featured on the other side of the road as you enter the Plano Commmunity Garden. 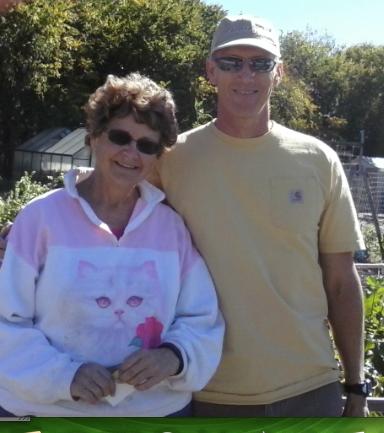 Patty Pierce and Mark O. were the first urban gardener volunteers we met there today. 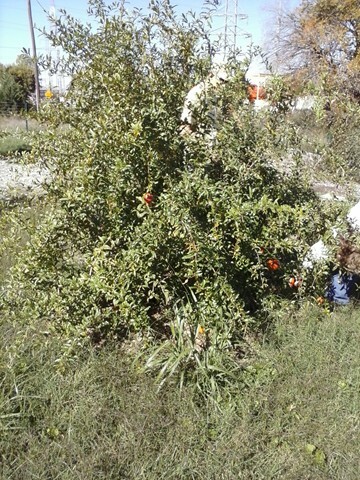 They were in the orchard choosing pomegranates from the several pomegranate trees in the common orchard. They really looked yummy. I almost asked for one for myself. I also noticed fig bushes, pear trees, and peach trees in the orchard. Although the orchard is still young, it is already producing fruit. 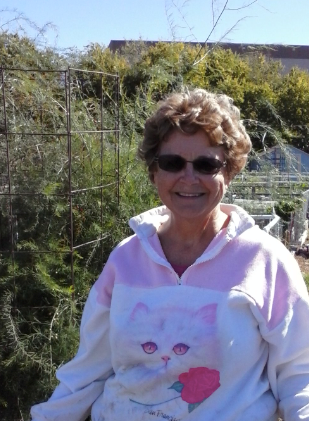 Patty is one of about 25 volunteers who keep the 50 garden plots of the Plano Community Garden going. Like all urban gardeners I've met so far, Patty is knowledgeable, cheerful and willing to share her knowledge. Below is a photo of Mark and Patty. Mark was spraying some tomato trees with a pesticide sprayer marked "Roundup". Of course, I just about fainted. When I recovered from the shock I asked him what was in the container. He told me that it was "BT" which is an organic bacteria that kills bugs that infest tomatoes. I guess Monsanto sells those spray containers branded "Roundup" but you don't necessarily need to put Roundup in it to spray your plants. BT stands for Bacillus thuringiensis. Not all agree that BT is safe, however. Here is more information on that if you care to know and decide for yourself. [Source] I am of the opinion that bugs don't eat that much so I let them have their way in my garden. I'm finding there is still more than enough left for me to eat. 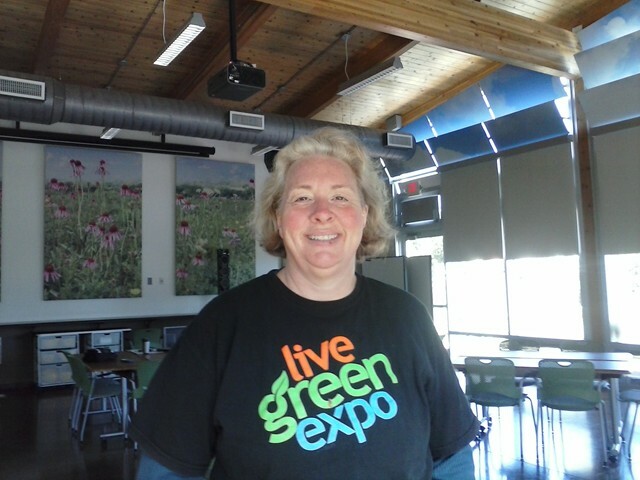 Below is a photo of Erin Hoffer, Environmental Education Coordinator and Master Gardener. 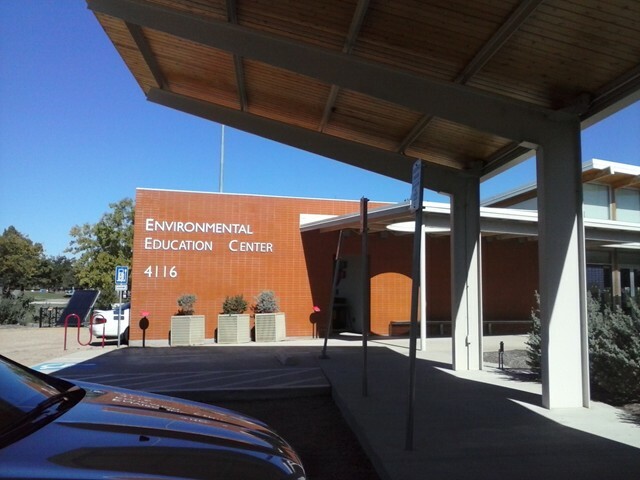 Erin is standing inside the Environmental Education Center (City Of Plano) at 4116 W. Plano Parkway Plano. I'll say more about the Center and Erin later. 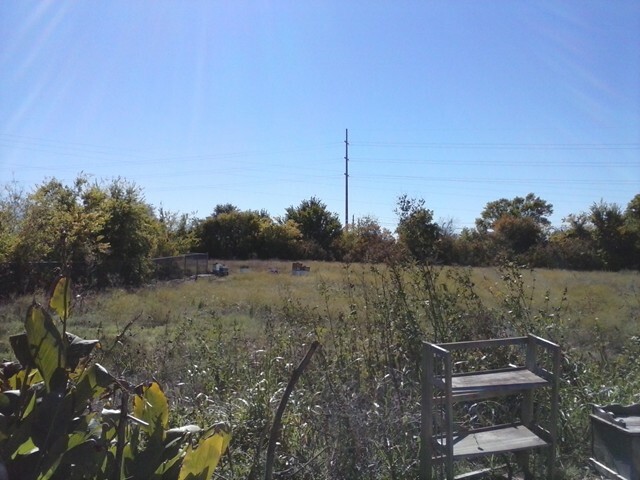 For now, let us finish our tour of the Plano Community Garden. Asparagus and lots of it in the garden. I was impressed with the amount of asparagus growing all over the various garden plots. In my opinion--a very good thing since asparagus is a perennial vegetable. Inspriration for Garden Decorative Borders: Throughout the garden, several urban gardeners have filled colored bottles with sand and inserted them into the soil bottoms up. 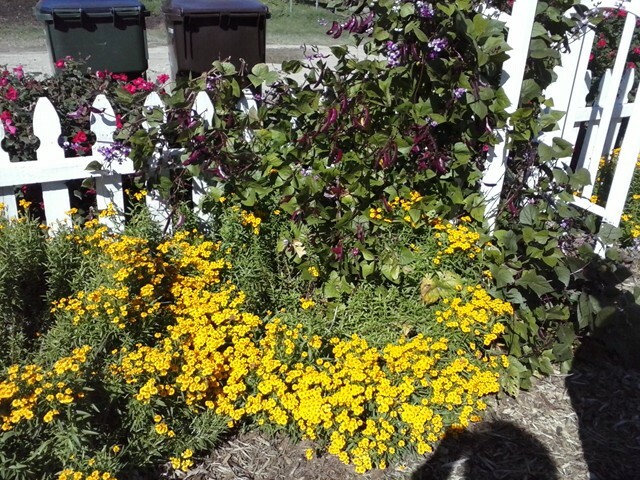 It makes for a colorful and interesting border to plant beds. If you look carefully in the shadows of the phot below, you can see them. Below is a covered area where volunteers gather in the summer to get water, visit and escape the heat. When I asked Patty if this was where they held the classes, she said, "Oh no, we do that at our environmental education center." She later took me on a tour of that facility and introducted me to Erin Hoffer. I had envisioned a similar structure, only 2/3's this size for an outdoor classroom at our facility here in Garland. Below is the view one sees from the perspective of the roof-covered area in the photo above. 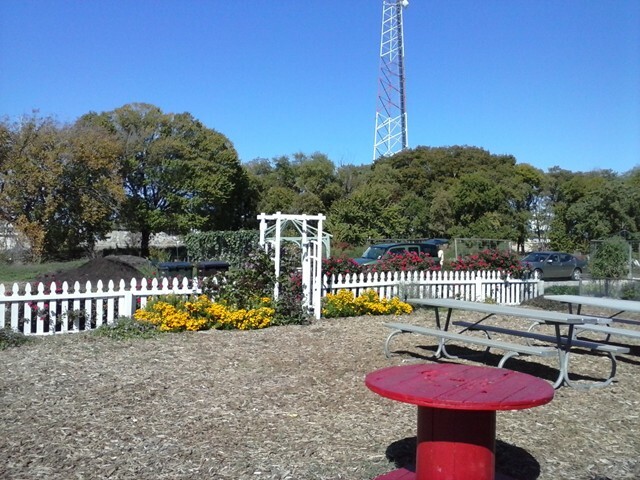 Notice the red painted cable spindle in the foreground--another of many examples of re-use in their garden. I loved all the creative uses of materials and resulting functional designs. 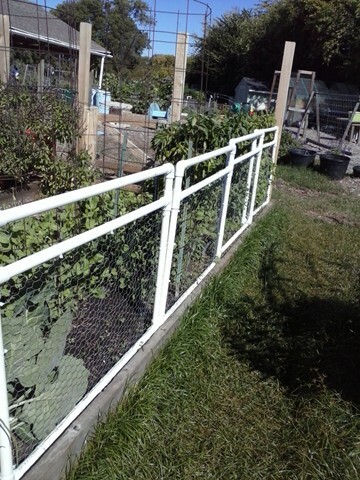 For example below is wire fencing that has been bent over leafy greens (I think swiss chard). Then the gardener put netting over the wire to keep pests out. 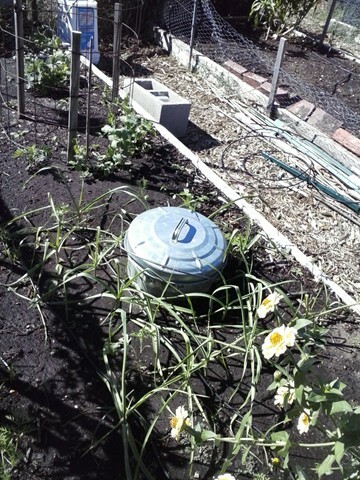 This same simple design would suffice to protect plants from light frosts too. 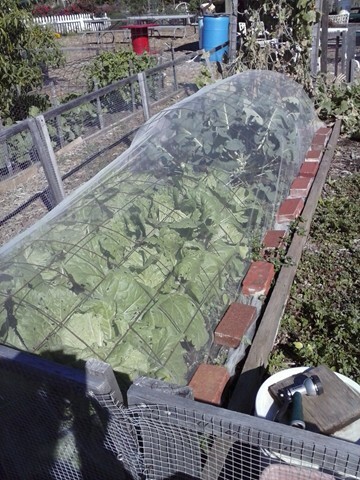 Instead of netting, plastic sheeting would be used. Bricks are then placed to secure the netting (or plastic covering). This design is lightweight and mobile--very easy to open up access to a garden area. You just lift the section up off its rebar. 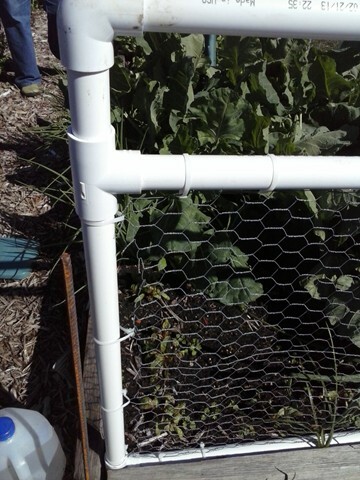 Notice how ty-wraps secure the chicken wire to the PVC pipe. The photo below provides a larger view of the overall appearance of this highly mobile fence. Below Patty shows us one of her bell peppers. 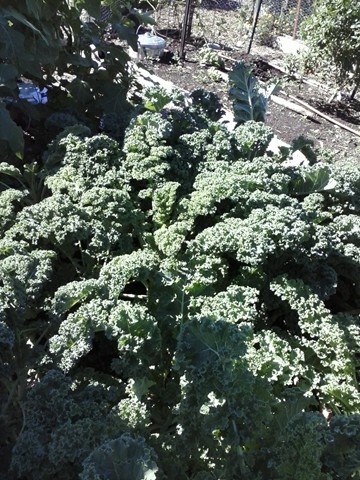 And here we see Patty's Kale--beautiful and healthy. And here we have a lush bed of tarragon. The Plano Community Garden is beautiful, charming and practical. It's a great place to make you feel better--even when you are already feeling great. Here are a few more photos for you to enjoy, but it is much better to see in person. Yes, they have beehives too. If you look carefully in the photo below, you will see them in the distance near the middle of the photo. This is another whole, yet connected story. 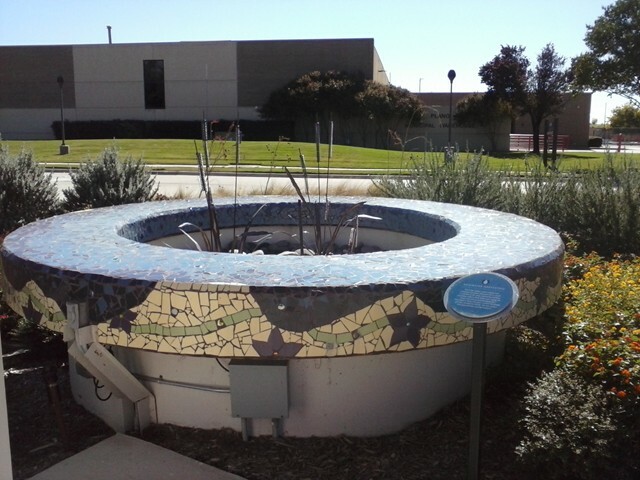 This LEED certified building is located a short distance from the community garden. It is what happens when citizens love their city and its environment enough to pass a bond issue to ensure that it continues to become greener and greener and healthier and healthier for its citizens. Erin Hoffer took me on a tour of this wonderful center--almost all of which was built from repurposed and recycled materials. It is fantastic. The roof that you see in the foreground supports solar panels that provide energy for the center and there is so much more--a living roof, rainwater harvesting, etc. Charlie and I plan to revisit this building and I will write more about it at that time. Even from today there is so much more to tell--for example, about the Plano Recycling center. . .
Did you ever see such a beautiful cistern for collecting rainwater? 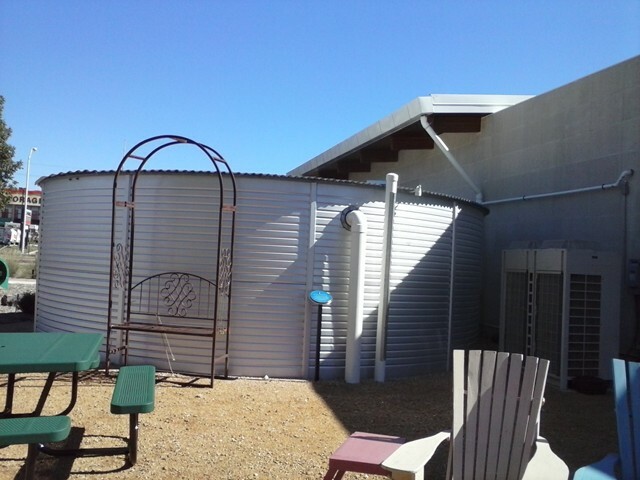 This one collects rainwater from the roof of the center and then it is pumped to the back of the building where it is stored in a 20,000 gallon storage tank. This is the 20,000 gallon storage tank where the harvested rainwater is stored. In closing, the center has a lovely art piece--a sculpture of butterflies fashioned from aluminum cans. A collection of led lights cast shadows that move across the background of the sculpture.